“There are approximately 17 million strokes per year throughout the world -50,000 per year in Canada. The standard therapy is to ‘fix the pipes’ - to treat the arteries that might be blocked or sending clots or debris to the brain. This is done with a clot busting medication (tPA) or with endovascular devices used to mechanically retrieve the clots. Both have limited application due to the potential complications of tPA, and the technology intensiveness needed for endovascular therapy. But research to develop new or better treatments is not easy. 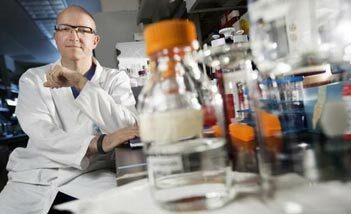 “The way that one begins to develop a stroke cure is to get a grant. This was our start case, when we developed a promising new treatment: a competitive inhibitor of the neuronal protein PSD95, which protects rats from stroke by preventing the progression of ischemic damage. The next typical step is to disclose your findings to your institution and they will ‘do the heavy lifting for you’, i.e. they will protect your intellectual property and facilitate the process of gaining a patent, and then take 50 to 70% of the money earned by the invention. Tech transfer offices providing these services have been proliferating, but 87% of them don’t make their expenses. “Pharmaceutical companies in general are not keen on developing stroke damage reduction medications because of the miserable record of failure of past clinical trials. There are over one thousand rat stroke cures and no human stroke cures. We are, so to speak, in a ‘nuclear winter of stroke treatment”. Mike Tymianski went to Chris Page and Bob Bell at UHN with the proposal that he would start his own company - NoNo Inc., and do the heavy lifting himself. UHN could become a shareholder, but the company would own the intellectual property. They agreed. “There is a misconception that there is no money available in Canada for investment. In fact there is very substantial money available. Investors tend to put it in the resource and financial sector, whereas biotechnology investment is minor in Canada. Nonetheless it can be extremely rewarding if a health technology is successful, but the success rate is relatively low. “As part of our drug development strategy we conducted seminal studies in cynomolgus monkeys and published our work in Nature. Even with this, big pharma is only interested if the results are robust, reproducible, the drug has a clear and validated mechanism of action, and the drug is safe. 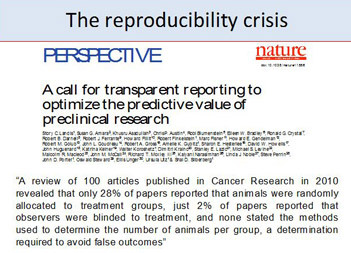 Reluctance from Pharma to invest otherwise is due to very low rates of reproducibility of certain drug data, and poor science. For example, a small proportion of research studies are blinded and very few have reliable statistical methods. They want certainty about the mechanism of action of any new drug. There is a small, but measurable area of damage that is very subtle but frequent in the surrounding brain when an aneurysm is treated by endovascular means. Mike and his colleagues decided to study these mini- strokes to test efficacy. They studied 185 patients in a multi-center randomized, placebo controlled trial and found that patients who received the PSD95 inhibitor drug NA-1, had 50% fewer strokes than those who received placebo. They’re now doing pivotal trials to prove benefit. One involves giving NA-1 or placebo in the ambulance to patients with suspected stroke on the way to 5 stroke centers in Toronto, Peel and Vancouver. This trial significantly involves the emergency medical services (EMS) personnel who give the drug within 60 minutes. In the first 75 patients, they met this goal. “EMS personnel are very keen on this trial because now they are actively involved in treatment, not just lorry drivers bringing untreated stroke patients into the hospital for treatment. We are now training thousands of emergency medical service personnel. A second trial, set to start this year, will administer NA-1 or placebo to patients who undergo endovascular stroke therapy at several centers in Canada, the USA and Europe. Residents’ Corner: Welcome New Residents!